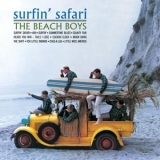 The Platinum Collection (compilation) (2005), Endless Summer (compilation) (1974), The Very Best Of The Beach Boys (compilation) (2001), Sounds Of Summer: The Very Best Of The Beach Boys (compilation) (2003), Surfin' Safari (this album) (1962), Good Vibrations: Thirty Years Of The Beach Boys (compilation) (1993), The Greatest Hits – Volume 1: 20 Good Vibrations (compilation) (1999), Made In U.S.A. (compilation) (1986), Best Of The Beach Boys Vol. 2 (compilation) (1967), The Capitol Years (compilation) (1980). Showing latest 5 ratings for this track. | Show all 40 ratings for this track.